From Alaska to Maine in salt water or fresh, Gaging.com LLC supplies measuring instruments that can handle the rugged environments that this industry presents with simplicity and accuracy. Calipers can be used to measure crabs, fish or other sea life. Gaging.com has years of experience in this field. Call us and use our knowledge and prices to your advantage! DISCONTINUED by Manufacturer. Click Here for the new version! The 54-100-444 Fowler Ultra-Cal Ma.. Introducing Fowler/Sylvac's Electronic Water/Oil Resistant Caliper with Sylvac's patented inductive .. 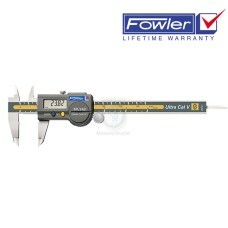 The 54-100-067-1 Fowler Ultra-Cal V Electronic Caliper is on sale at Gaging.com! Lifetime Warranty .. The 54-100-067-C Fowler Ultra-Cal V Electronic Caliper 6"/150mm with ISO/A2LA Certification is on sa.. The 54-100-068-1 Fowler Ultra-Cal V Electronic Caliper is on sale at Gaging.com! Lifetime Warranty .. The 54-100-069-1 Fowler Ultra-Cal V Electronic Caliper is on sale at Gaging.com! Lifetime Warranty ..